Have you ever eaten a burger made with a portobello mushroom cap? It is insanely delicious and weirdly similar in texture to meat. Needless to say, portobellos as burgers are a great alternative for vegetarians, vegans, and even for meat eaters too. 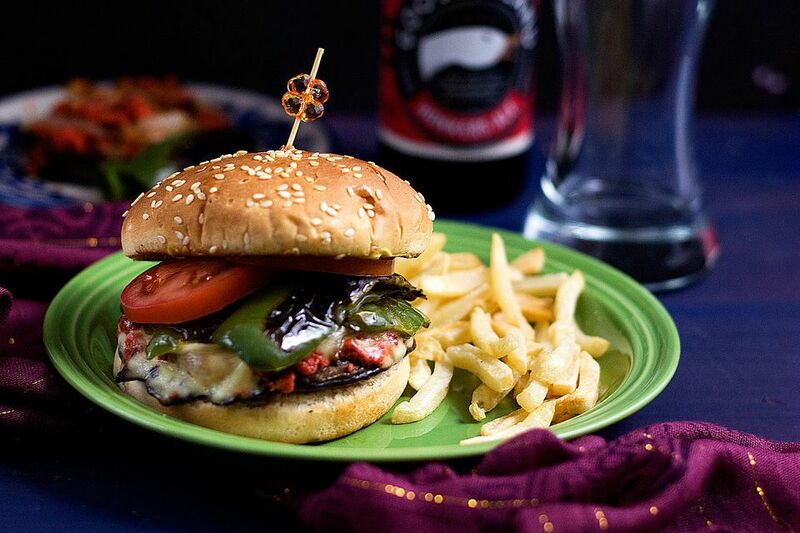 This veggie burger is like no other, it uses a mushroom cap that is filled with vegetarian chorizo and grilled onions, then topped with cheese, grilled chilies, and tomatoes. It is super satisfying and filling too. You can make it any day of the week and all year long. 1. Rinse the portobellos and gently pat dry with a paper towel. Gently pull off, or cut off, the stem from each mushroom. Then use a spoon to scoop out the gills from each mushroom cap -- careful not to remove the edge, you want to keep that overlapping edge so that it can hold the filling. Brush each mushroom with a little bit of oil and set aside. 2. Heat about 1.5 tablespoons of oil in a pan, once hot add the onion slices and sauté over medium-low heat. You want to cook them until they are completely soften and begin to brown -- but not burnt. While the onions are cooking, heat another couple of tablespoons in a different pan, once it's hot add the chorizo. Sauté it until it begins to caramelise and it no longer has any moisture. You'll want to keep stirring both the chorizo and the onions as they cook, and turn off the heat once they are ready. 3. Heat a large frying pan or a flat grill, and drizzle some oil over it. Place the jalapeño halves onto it and allow to cook until each piece has softened. Remove from heat and set aside. Next place the mushroom caps onto the pan/grill with the scraped side facing up. Cook the mushrooms until they begin to soften. Once the portobellos are soft, scoop two to three tablespoons of the cooked chorizo into each cap. Then top with a little bit of the cooked onion, and a slice or two of cheese per mushroom cap. Allow the cheese to melt before removing from the heat. 4. Toast the buns, if desired, then spread some mustard and mayonnaise onto each bread. Place the portobello burgers on the bun, then top with the fried jalapeño halves and a couple of tomato slices. Server right away.